The Geberit Monolith unit & Cistern for floorstanding WC's, provide your bathroom the latest modern designer look, with the award-winning Geberit Monolith range. An elegant sleek space saving back to wall unit with intergrated cistern made of high grade glass and brushed aluminium, cleverly conceals all the sanitary technology behind a high-quality glass panel. A fast and easy way to install a more aesthetically pleasing alternative to visible cisterns, aswell as providing a solution for people who are unable to conceal there cistern behind a wall. Cistern and sanitary technology elegantly concealed. 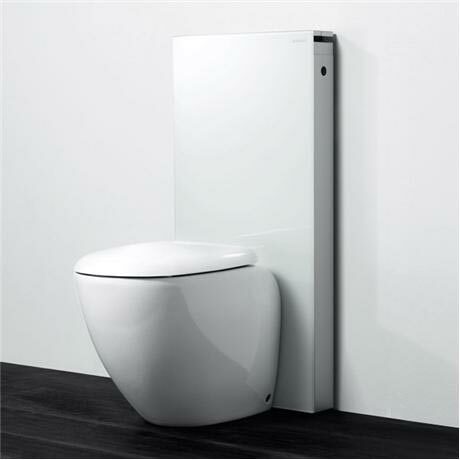 A stylish alternative to a WC with a cistern in front of the wall. Modernising and renovating made easy. Design that fits any bathroom. Please note - toilet pictured attached to monolith is not included (sold separately).